An artist who specializes in drawing on chucks talks about her work. 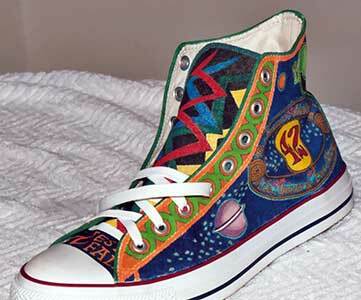 Custom painted Chuck Taylors by Laurie Lyden are art for your feet. I’ve been doing custom chucks since 1991 or so. I started when I was attending Youngstown State University. I did a pair of low tops for myself featuring a purple cow standing in a field at sunset, with a line from the Ogden Nash poem, along with some floral print that I copied from an old fabric jewelry box I had, some paisley, and the one design that I repeat. It’s a kind of positive-negative space figure-ground doodle thing that I’ve been doing on notebooks and such ever since grade school. I like the fact that it’s impossible to distinguish which color is the design and which is the background. That is the one design that you’ll see repeated in my shoes, in lots of different color combinations. I did a pair of high tops for a friend of mine back then with a Garden of Eden theme on one side. I wish I had taken pictures of some of those older ones. My first pair ended up in a car that was impounded, and I never saw them again... don’t ask. I put the shoes aside for many years once I got married and started working full time and raising children. I now have an almost sixteen-year-old daughter who loves alternative and punk rock music and is a fan of many of the musicians who wear Chuck Taylors, especially Billy Joe Armstrong of Green Day. I made her a pair of custom chucks for her birthday last year, and it was like coming full circle. Katie is a real chip off the old block. She makes jewelry out of pop tabs. She’s been wearing them on a daily basis for a year, and they’re utterly shredded and falling apart. I’m not the kind of mother who would ever think of making her get rid of them though, just when they’re finally broken into a state of perfect softness and ventilated just right. When I was her age, I had a pair of blue ones that were put away wet and subsequently mildewed. I washed them to get rid of the smell, and the random black dots that were left made them infinitely cooler, at least in my opinion. My mother threw them away, and I’m still not quite over it. The colors on her shoes have faded some, but the designs are still clearly visible. I want Katie to wear them and enjoy them. When they’re completely destroyed, I’ll just make her another pair. I get inspiration from tattoo flash, particularly tribal and Celtic patterns. I go to the sites that have free flash, since I won’t use anything copyrighted without paying for it, and they usually have big watermarks on them anyway. For the most part though, I get my ideas for the designs on each pair of shoes based upon the person I am creating them for, and what their interests are. My “Sistine Chapel” of sneakers are the two pairs of custom chucks I did for the 14-year old twin sons of my very best friend in the whole wide world. Seth and Ryan are truly outstanding kids, and their shoes are completely over the top. They’re both into math and science. For Ryan’s shoes, I went online and got the first 200 or so digits of pi, and incorporated them into a grid pattern with a different color background for each number. The result was a nifty sort of random mosaic that I feel says something about the hidden beauty in numbers. For Seth, I looked at illustrations of the DNA double helix molecule found in medical articles online, and created it in 3D, with a caption that says, “How do you spell DNA?” That was one of my first experiments in color blending on the shoes. They’re both fans of Star Wars and the Douglas Adams “Hitchhiker” series, and so those themes are present on the shoes. Each shoe also has a rock-and-roll side featuring bands that the boys are into. The figure-ground pattern is present on both pairs. The colors were inspired by their school colors. Each pair has their first and last name on the toe, in the space between the last set of eyelets and the rubber of the toe. There are also messages on the strips that run down backs, references that Douglas Adams fans would recognize. It took me about a month to do each pair. I worked for a few hours almost every night, in the evenings after I put my five year old to bed, sitting on the couch, watching TV. To me, it’s something relaxing to do with my hands, and a way to challenge myself. Some people crochet Afghans or knit. This is what I do. Click here to see a photo gallery of Laurie’s work. Every pair is drawn completely by hand. I draw the designs on first, using a very fine point Micron pen, .10 or .20. Art stores carry them. They’re used in scrapbooking, archival quality ink. There’s no way to sketch anything in. It’s done in ink, with no margin for error. The colors are done with fine-point fabric dye pens. It took a process of trial and error for me to find them. I started out with Sharpies years ago, but those are not completely waterproof. The dye pens are actual fabric dye. The colors sink into the canvas and are completely permanent. They will fade over time, just like the colors of the actual canvas shoes will, but they don’t run or bleed. My designs can be washed in the washer. It would be very difficult for me to put a price on the shoes I did for the twins. I probably have a hundred hours in each pair. If I were to charge five dollars an hour for my time, that would come out to $500 a pair, not counting the cost of the shoes themselves. So for custom design at that level, it really has to be a labor of love. I can knock them out more quickly if I focus primarily on patterns like tribals, the figure-ground, paisleys, and florals. The Celtic designs take forever, and they give me a headache, but they’re so cool. For a pair that is primarily patterns, with maybe a little lettering, I would charge about $250.00. This price includes the shoes, and I can do them in a week to two weeks. If I’m really cranking on a pair and trying to finish them quickly, I can rely on my oldest daughter to color in some of the designs for me. It was rough for me to give up even that degree of control, because I’m such a raging perfectionist; but she does a good job. I can do very precise lettering in a variety of fonts, but that requires a lot of time and concentration too. I don’t use stencils for anything. They don’t work very well, because I can’t get them to stick to the shoes without shifting around; and stencils don’t allow for the minute adjustments it takes to give the appearance of straight lines of lettering on a 3-D shoe surface with curves. I’ll print out a sheet with the alphabet in the font I’m using so I can refer to it while I’m working, but all of the lettering is free-hand. A piece of thin cardboard from a box of cigarettes works well as a straight edge to guide my pen, because it’s flexible. I’ve only sold a couple of pairs, including one pair that I traded for a painting for a local artist. I live in Youngstown, a dying steel town in northeastern Ohio where the economy is depressed. Although people go crazy when they see my shoes, not many people are willing to shell out for them. I will continue to do the shoes whether I make money with them or not though. They are a creative outlet for me, if nothing else. I don’t want to water down the craft involved in order to make a quick buck. I have always loved to draw. I spent most of high school in the art department, and I was a studio art major at the beginning of my college career. Visual arts have always been a passion for me. I am also a self-taught seamstress and enjoy designing and making clothes, Halloween costumes, custom window treatments, slipcovers, and anything else that comes into my head, as well as trash-picking furniture from the curb and painting it. I’m 37 years old, a single mother to three children. I never graduated from college, and I would like to go back to school eventually. I work as the office manager/survey crew for my father’s engineering business, but the artist in me comes out at every turn.